While I try to give as much as possible on this website, there are many more resources available that you can use or read. Most of it is directly connected with Hotel Marketing or Hotel Technology companies, but some of is it just extra goodies. 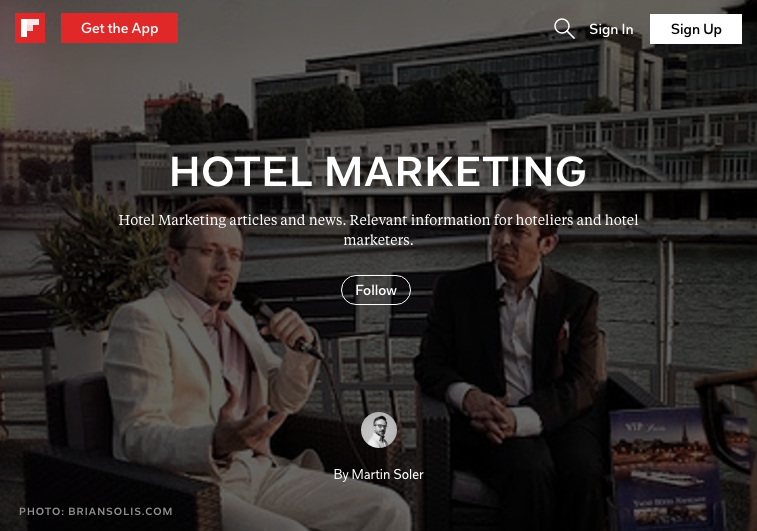 A curated magazine for Hotel Marketing people on Flipboard. I try to keep it to one or two articles a day so it stays relevant for everyone with a busy schedule. The articles here are all curated and relevant for hotel marketers and hoteliers. Sent approximately once a week, tell. newsletter covers the most interesting hotel marketing and hotel technology articles that have passed. Already a standard for the industry, tell. is rapidly becoming a must read for everyone. To access earlier issues, click here. Together with SnapShot and ESSEC, we put together a complete hotel management course which you can follow on Coursera at your own pace. In this course I cover the basics of Hotel Marketing in 11 videos that you can watch here. I never read quite enough, but I do try. Those longform articles I've found from around the internet and which I liked, I comment and share on this list with the Pocket app. You can read it online and save to your own. I try to explain why I shared it every time.